A century ago, farmers plowed the ground and raised crops where St. Joseph Mercy Ann Arbor’s 364 acre campus is today. On April 14, 2010, a horse-drawn plow tilled a four-acre plot under the shadow of the new hospital. The Farm at St. Joseph Mercy Ann Arbor is believed to be the first hospital-based farm in the state of Michigan, and one of only a few nationwide. 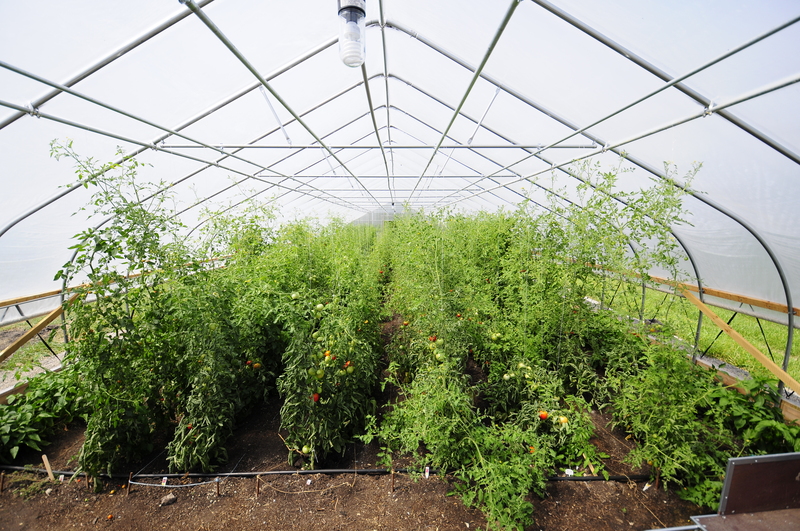 With the help of volunteers in 2010, two 30’x 96’ hoophouses were constructed to allow crops to grow year-round so they can be sold at the hospital’s weekly Farmers’ Market. In 2013, the third hoophouse was completed as the first accessible clinical hoophouse for patient care. Farm fresh produce is included in hospital food, as well as the menu of Huron Woods on the campus of St. Joseph Mercy Ann Arbor. “We are excited to be able to use the land in its original form.” said Rob Casalou, president and CEO of St. Joseph Mercy Ann Arbor, Saline and Livingston, adding that produce also will be donated to Food Gatherers of Washtenaw County. The list of vegetables includes tomatoes, basil, broccoli, lettuce and peppers. Dan Bair, a local farmer contracted by St. Joe’s, tends the land and runs the farmers’ market. The long-range vision is to increase horticultural therapy based patient care and nutrition based youth programming at The Farm. This farm effort is really cool and very appropriate. Are the vegetables grown organically? Are they at least not sprayed with chemicals? Great question Bruce. We are not USDA certified organic. However, we do not use synthetically derived chemicals in our operation. We focus on feeding the soil, and a healthy soil leads to healthy plants, which leads to healthy people. Are you able to share planning materials and lessons learned re: starting up with other organizations? Any materials available? I work for a St. Joe’s in Canada and we are entertaining a similar idea. If you don’t use synthetically derived chemicals what do you use if anything? Are your seeds GMO? We occasionally spray with products approved by OMRI, the Organic Materials Review Institute. We use organic seeds when available and do not use GMO seeds. Do you ever offer a short tour for student groups? We are studying plants and gardening and would love a tour..
Hi Mary. I’d be happy to give your group a tour. You can email me at carefulfarmer(at)gmail(dot)com. Thanks!